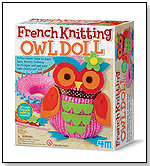 Follow simple steps to learn basic French Knitting techniques and sew your own chubby owl doll. 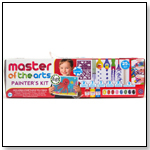 Contains 1 set of pre-cut coloured felt shapes. 24-pronged French knitting reel, crochet hook, yarn, stuffing, ribbon, glue, plastic needles and detailed instructions. (Makes a 12cm tall chubby owl doll). Made by 4M, distributed by Toysmith in the USA.